There are various fields of engineering, electrical and electronics engineering (EEE), electronics and communication engineering (ECE), computer science engineering (CSE), and so on. The project work is part of the engineering course academics which will help the students to gain practical knowledge and also hands on experience. If we consider EEE branch and ECE branch, then the project work may include designing electronics projects with electronics circuits. The connection of various electrical and electronics components using connecting wires on a breadboard or by soldering on PCB to form circuits which are termed as electrical and electronic circuits. In this article, let us discuss about a few simple electronics projects for beginners which are built with simple electronic circuits. There are several numbers of simple electronic projects for beginners that include DIY projects (Do It Yourself), solderless projects, and so on. The solderless projects can be considered as electronics projects for beginners as these are very simple electronic circuits. These solderless projects can be realized on a breadboard without any soldering, hence, termed as solderless projects. Night light sensor, overhead water tank level indicator, LED dimmer, police siren, touch point based calling bell, automatic toilet delay lighting, fire alarm system, police lights, smart fan, kitchen timer, and so on are a few examples of simple electronic circuits for beginners. The fans are frequently used electronic appliances in residential homes, offices, etc., for ventilation and for avoiding suffocation. This project is intended for reducing wastage of electrical energy by automatic switching operation. The smart fan project is a simple electronic circuit that gets switched ON when a person is present in the room and a fan gets switched OFF when a person leaves the room. Thus, the amount of electrical energy consumed can be reduced. The smart fan electronic circuit consists of an IR LED and photo diode used for detecting person. A 555 timer is used to drive the fan, if any person is detected by IR LED & photo diode pair, then the 555 timer gets actuated. The night sensing light is one of the simplest electronic circuits to design and is also most powerful circuit to save electrical power by automatic switching operation of the lights. The most commonly used electronic appliances are lights, but it is always difficult to operate them by remembering. The night sensing light circuit will operate the light based on the light intensity falling on the sensor used in the circuit. The light dependent resistor (LDR) is used as a light sensor in the circuit which automatically turn ON & OFF the light without any support of human. The LED lights are preferable as they are most efficient, long life and consumes very low power. The dimmability feature of LEDs is used for various applications such as intimidating, decorating, etc.,. Even though LEDs are being designed for dimmablilty but to obtain better performance LED dimmer circuits can be used. The LED dimmers are simple electronic circuits designed using a 555 timer IC, MOSFET, adjustable preset resistor and high power LED. The circuit is connected as shown in the above figure and brightness can be controlled from 10 to 100 percent. In our day-to-day life, we typically use many simple electronic circuits such as calling bell, IR remote control for TV, AC, etc., and so on. The conventional calling bell system consists of switch to operate and which creates buzzer sound or indicator light on. The touch point based calling bell is an innovative and simple electronic circuit designed for replacing the conventional calling bell. 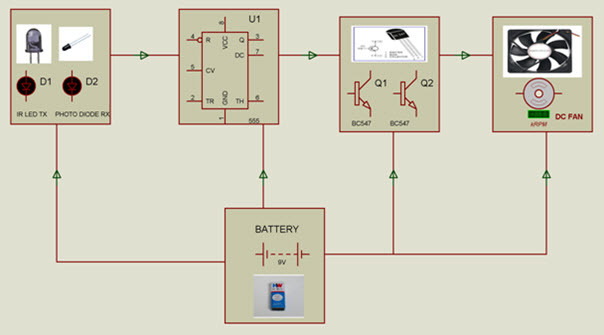 The circuit consists of touch sensor, 555 timer IC, transistor and buzzer. If the human body touches the touch sensor of the circuit, then a voltage developed on touch plate is used for triggering the timer. Thus, the 555 timer output goes high for a fixed time interval (based on the RC time constant). This output is used to drive transistor which in turn triggers the buzzer for that time interval and turns OFF automatically after that. The most essential electronic circuit for residence, office, every place in which there is a possibility of fire accidents is a fire alarm system. It is always difficult even to imagine a fire accident, so the fire alarm system helps to extinguish the fire or escape from fire accidents to reduce human loss and property loss as well. The simple electronic project built using LED indicator, transistor and thermistor can be used as fire alarm system. This project can be used even for indicating high temperatures (fire causes high temperatures) such that the cooling system can be turned ON to reduce the temperature to limited range. The thermistor (temperature sensor) is used for identifying changes in temperature and thus alters the transistor input. Thus, if the temperature range exceeds the limited value, then the transistor will turn ON LED indicator to indicate high temperature. Similarly, there are numerous simple electronic circuits which we use in our day-to-day life and all these can be designed by yourself with a little guidance. Are you interested to know about latest electronics projects for beginners? For any technical help in developing projects, get in touch with us by posting your ideas, views, comments, and suggestions in the comments section below. Next › What are the Differences between BJT and MOSFET? For further details please contact Niranjan on +91-9959178000. This chaitra here, I’m Master’s student with VLSI as my specialization. I’m looking for projects in my field and so need some suggestions and assistance from you.I would appreciate if you can get back to me for further detail talks. Hoping to hear from you. Regret,we don’t have projects related to VLSI.